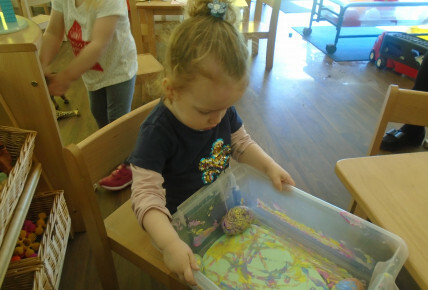 We've had a cracking time this Easter the children have been taking part in different Easter themed activities such as card making and Easter nests. The children enjoyed getting stuck in when making the chocolate nests, crumbling up the cereal, melting and mixing the chocolate before constructing the nests. "My eggs are from an Eagle", "Mine are from a chicken". 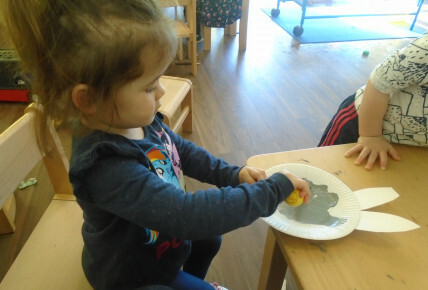 We also had lots of fun rolling plastic eggs back and forth to create patterns on our paper, we also made some lovely Easter bunny masks using paper plates. 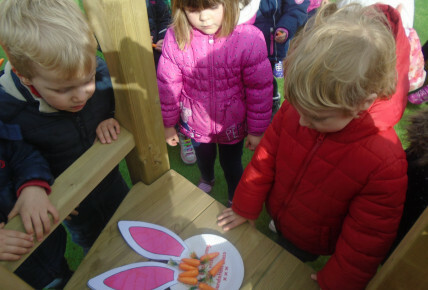 Finally all the children took part in an Easter egg hunt, where the pre-school children went to find shiny carrots to then feed to the Easter bunny. 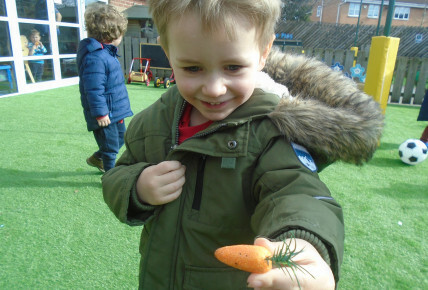 The children left the carrots out for the Easter bunny in the hope he would bring them some yummy chocolates and that's eggsactly what happened.